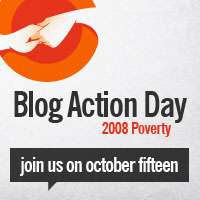 I've signed up Coxsoft Art News for Blog Action Day 2008 Poverty, because I'm poor. Last year I wrote a number of posts on the environment for Blog Action Day and got a lot of stick from some pedant who claimed that wind farms sited in the right place don't kill birds. A likely story. They just don't kill so many as when they're sited in the wrong place. My favourite Action Day post was Porkers Amok! (CLICK). How to campaign about being poor? Write begging blogs? Two thousand years ago a famous Jewish philosopher commented "The poor are always with us". You think we'll come up with the answer by 15 October?